DESCRIPTION: 148 pages, 162 black & white illustrations, size 8.5 x 11 inches. 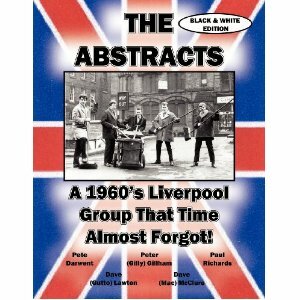 Originally published with numerous color images (ISBN 9781588501615) this documentary was well received as representative of a true to life snapshot of one of the many ‘other’ Merseybeat groups of the sixties. A number of requests for a less expensive version ultimately resulted in the publication of this black and white edition. While the Beatles are by far the most famous Liverpool group of the era, they did not create the ‘Mersey Sound’, it created them. Unfortunately, it’s sad that a great era of musical history will only be documented for future generations by the multitude of books that have been written about them. Liverpool in the 60’s was a wondrous place, it was alive with music and the sheer number of local musicians and the depth of the talent pool was mind numbing. Depending on your method of research, you will find that there were between 750 to 950 Liverpool based groups performing at any one time during the early to mid 1960’s. So here’s a story of one of the not-so-famous groups that’s part of that total. While their story will always be overshadowed by those that made the ‘big time’, it is an honest and down to earth tale and a fairly typical representation of the many hundreds of other groups that created the ‘Mersey Sound’ and the real Merseybeat era. “The 1960′s were a time of change and uncertainty. In 1961 the Berlin wall was built, in 1962 the Cuban Missile Crisis erupted, in 1963 JFK was assassinated, and on February 7, 1964 the Beatles arrived in New York to be welcomed by 10,000 screaming fans and music, as the world knew it, would never be the same again. While the Beatles are by far the most famous Liverpool group of the era, they did not create the ‘Mersey Sound’, it created them. Unfortunately, it’s sad that a great era of musical history will only be documented for future generations by the multitude of books that have been written about them. Liverpool in the 60′s was a wondrous place, it was alive with music and the sheer number of local musicians and the depth of the talent pool was mind numbing. Depending on your method of research, you will find that there were between 750 to 950 Liverpool based groups performing at any one time during the early to mid 1960′s.